“Petavel points out that Scripture frequently uses aion, aionios, and their Hebrew counterparts (olam in various forms) of things that have come to an end. The sprinkling of blood at the Passover was an ‘everlasting’ ordinance (Exod. 12:24). So were the Aaronic priesthood (Exod. 29:9; 40:15; Lev. 3:17), Caleb’s inheritance (Josh 14:9), Solomon’s temple (1 Kgs 8:12-13), the period of a slave’s life (Deut 15:17), Gehazi’s leprosy (2 Kgs 5:27)---and practically every other ordinance, rite, or institution of the Old Testament system. These things did not last ‘forever’ in the sense of ‘time extended without limitation.’ They did last beyond the vision of those who first heard them called ‘everlasting,’ and no time limit was then set at all. According to this view, held by Petavel, Froom, and others, this is the meaning of ‘eternal’ in the Bible. 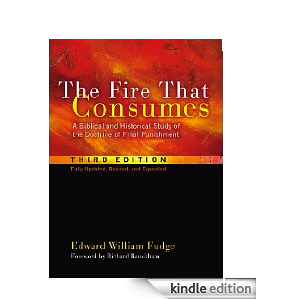 It speaks of unlimited time within the limits determined by the thing it modifies” (Edward Fudge, “Everlasting Things that Last Forever, And Some That Do Not,” from The Fire That Consumes: A Biblical and Historical Study of the Doctrine of Final Punishment, Third Edition. Eugene: Cascade Books, 2011). In my last post, I tackled immortality as a universal thing. What makes it so is that, when Adam and Eve sinned in the garden, because Adam was the father of the human race (and the human race came from Adam’s loins), death spread not only to Adam but to all men (Romans 5:12). If death was the universal punishment, immortality must have been the universal God-given gift. This is a self-evident biblical inference. In this post, though, Fudge attempts to press forward the annihilationist view by showing how the word “eternal” within Scripture can illustrate a limited amount of time, not time without end. What I will demonstrate is that the word “eternal,” as does the word “destroy” (and all words included) must be determined by the context. Without context, anyone can make certain words mean anything they want to. Let’s start with the items above that Fudge notes use the word “eternal” but do not last forever: priesthood, the life of a slave, Caleb’s inheritance, the sprinkling of the blood at Passover, etc. The word “eternal” is used with these things, but context dictates that the word here does not mean “without end of time.” Why? Because the Aaronic priesthood was done away with in Jesus (see Hebrews). The life of a slave ends, for the slave will die like everyone else. This seems to make sense to most individuals. “To be guilty of an ‘eternal’ sin (Mark 3:29) is to be guilty of one that will not be forgiven even in the age to come” (Fudge, The Fire That Consumes). Here with Mark 3:29, the word “eternal” used in this context means “without end.” For the person that blasphemes against the Holy Spirit (the context of Mark 3:29), there will be no forgiveness for this sin in this age or the one to come. In other words, there is no time at which the said individual will be forgiven. Fudge argues that the word “eternal” does not mean forever because he hopes that readers will agree with his annihilationist view. If one can argue that it is the results of an action that are eternal and not the action itself, he can say, “Consider eternal death; the dying is not eternal but the consequences are.” Annihilationism then seems to be a credible view when lined up against this train of thought. “If your hand causes you to stumble, cut it off; it is better for you to enter life crippled, than, having your two hands, to go into hell, into the unquenchable fire, WHERE THEIR WORM DOES NOT DIE, AND THE FIRE IS NOT QUENCHED. If your foot causes you to stumble, cut it off; it is better for you to enter life lame, than, having your two feet, to be cast into hell, WHERE THEIR WORM DOES NOT DIE, AND THE FIRE IS NOT QUENCHED. If your eye causes you to stumble, throw it out; it is better for you to enter the kingdom of God with one eye, than, having two eyes, to be cast into hell, WHERE THEIR WORM DOES NOT DIE, AND THE FIRE IS NOT QUENCHED” (Mark 9:43-48, NASB). Fudge presents the reader with an interesting take on the word “eternal” in this post. Nevertheless, the context itself works against Fudge and confirms the traditional view. Whenever the word “eternal” is used, context must always be considered...however, the word “eternal” can refer to the action as well as the result; and here, “eternal” refers to both. God bless.